Classy t-shirt for happy Vimmers - On the back of the t-shirts, we print :wq! 'by default'. If you prefer another command or simply nothing, please note it in the 'Comments' field of your order. The printing technique of this text on the back of the t-shirt is textile vinyl. The price of the t-shirt does not vary. 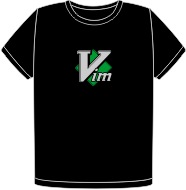 For each t-shirt, we donate 3.00 € to Vim.